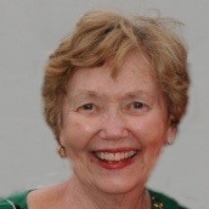 Sharon Kay Meyer (née Swenson) of Farmington, CT, formerly of Sarasota, FL, San Diego, CA, Golden Valley, MN, and North Mankato, MN died on January 25th, 2019. She was born on May 22nd, 1938 to Leroy and Lovera Swenson. She leaves behind children Kristin (David) Woznicki, Peter (Cathleen) and Anthony (Liza), grandchildren Amanda Webster (Taylor), Sarah, Samantha and Jake Woznicki and Annabel and Lydia Meyer, sisters Sandi (John) Frederick and Darla (Joe) Langhorne, in-laws, including, Pamala Struessel and Janet Wichmann, also many nieces and nephews. She was preceded in death by her beloved husband Pierre (Pete) and her parents. Sharon graduated from Mankato High School in 1956 and the University of Minnesota in 1960. She married her high school sweetheart Pete the same year. They moved to California where she taught school in Monterey and San Diego while Pete served as an Army Intelligence Officer. In 1963, they moved back to Minnesota to raise a family while Pete pursued a PhD in Psychology. Their daughter Kristin was born in 1964, followed by Peter in 1968, and Anthony in 1970. Once all three children were in elementary school, Sharon went back to work as a teacher, but soon began a career in Market Research first at Custom Research Incorporated (CRI) and then at Golden Valley based General Mills. There was no shortage of new products coming out of General Mills in the 70s and 80s, and Sharon’s children delighted in giving feedback on emerging brands such as Cookie Crisp Cereal, Fruit Roll-ups and even an early GoGurt prototype, which would become a constant staple in Sharon’s own refrigerator in subsequent decades. During her time at General Mills, Sharon was active in PEO, a sisterhood organization designed to assist younger women in attaining educational goals. Even as Sharon and Pete engaged in busy careers, they supported their children’s many activities and fostered an interest in music, sports, and academic achievement which the kids, in turn, have passed on to their own children. In her leisure time, Sharon enjoyed bridge club with friends, singing in church choir, and spending time with family at Lake Amelia in central Minnesota and during many vacations. In 1991, she and Pete moved to California where Pete established a branch of his industrial psychology firm which he co-founded in Minneapolis in 1981. They lived in both the Bay Area and San Diego , where Sharon worked at Cheskin Research and Luth Research, respectively. In 2003, Sharon and Pete moved to Sarasota, Florida where they became active in St. Paul Lutheran church, developed close friendships, traveled domestically and abroad, and spent much time with their cherished grandchildren. Toward the end of their lives, Sharon and Pete moved to New England to be even closer to family and for health reasons. We will remain deeply grateful to Sharon’s caregivers at Atria Farmington and Seasons Hospice. Particular thanks to Cee Cee, who supported Sharon in her last days. A funeral and memorial service will take place in Mankato, MN this spring. In lieu of flowers, memorial donations may be made to the Alzheimer’s Association, 200 Executive Boulevard, Southington, CT, 06489. Funk Funeral Home in Bristol, CT is assisting the family. Please visit Sharon’s memorial website at www.FUNKFUNERALHOME.com.